The tendency of separating coarse aggregate particles from the concrete mix is known as segregation. Generally, it is observed in the plastic stage of concrete. 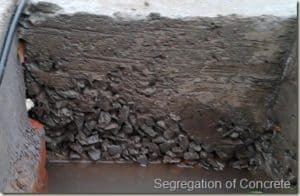 Segregation mostly occurs in very lean and wet concrete. Honeycomb, sand streaks, porous layers, rock pockets etc are the results of segregation in hardened concrete. 1. Excessive water content in the mix. 2. Use of poor graded aggregates. 3. Improper design of the mix. 4. Poor compaction of concrete. 5. Over vibration of concrete. Segregation can be avoided by taking following precautions. The design of the concrete mix should be done properly. Water content should not be added more than the desired amount. Handling, placing, and compaction of freshly mixed concrete should be done carefully. A proper vibration also reduces the chances of segregation. Concrete should not be dropped from more heights. Air entraining admixtures can be used to enhance the viscosity of concrete. Formwork should be always watertight to prevent leakages. Because it absorb the amount of water from the atmosphere and it require a small amount of water when compared to concrete that is almost 0.32 so it get hardens .. if you can remove moisture from surrounding than it doesn’t affect the cement which is not possible .